Yes, Mr. Trump has a permit. BUT, a National Carry Permit? The last thing you ever want is to have the federal government issuing national — or any — firearm carry permits. The feds do not have this power. The feds should never have this power. Your right to have a firearm anywhere in America should never depend on getting “papers” from any government, much less the federal powers in Washington, D.C. If you have a gun — constitutionally protected private property — and you aren’t doing anything inherently wrong, that should never be a crime. There is no victim. No one is harmed. No actual crime is committed. The idea that you need a wallet card to be somewhere you have a legal right to be is preposterous. Too many gun owners, including some leaders of the gun-rights movement, sincere but totally misinformed and misdirected, are salivating for our permit-carrying president elect to issue some sort of national carry plan. It cannot, must not, better not be a national permit in any way shape or form. Over 20% of these United States have enacted ‘Constitutional Carry’, that is law-abiding citizens may carry firearms without the need for permitage. Is there blood running in the streets in these States? No, in fact crime is down. Let’s cut to the chase, instead of pushing for more federal control and bureaucracy, let’s make The United States ALL Constitutional Carry! Simplicity. And less federal intrusion. What a concept! It’s been said, politics makes strange bedfellows. I’m not a fan of this guy, but, if he can make a living spewing juvenile, naughty drivel on pay-to-play radio – so be it. Howard Stern applauded President-elect Donald Trump’s policy which would give concealed carry permit holders from every state the right to carry legally in any other state Tuesday on his SiriusXM radio show. During his campaign, Trump told his supporters he believed in the right to concealed carry of firearms for eligible citizens and talked about supporting a national reciprocity policy for all legal concealed carry holders across the United States. I had gone shooting with friends, and marveled at the significantly lighter trigger of my friend’s Smith & Wesson .38 snubbie. 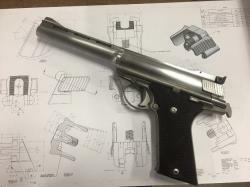 Having carried my electroless nickel S&W 442 for going on 22 years, with the stock 14 pound trigger(! ), I thought it might be time for improvement. I received it in about four days, found my brand X gunsmithing screwdriver, and went to remove the S&W sideplate. Two screws in, I discovered that screw #3 was NOT loosening! Not too much of a surprise, as the cheap screwdriver shaft was turning in the handle (! ), and I had never had the sideplate off. Ever. I own a second (better quality) gunsmithing screwdriver. However it remains beneath a pile of unpacked boxes. And between being disabled, having back problems (and just not wanting to) there it remained. My roommate said she had a quality gunsmithing screwdriver, and offered it for my use. I jumped at the chance. But Life got in the way. For almost two months. Sigh. FINALLY, I had the tool and the time. And access to the You Tube videos regarding J-Frame Smith smithing. And I began the task at hand. The sideplate was finally removed, and with some minor difficulty ( I repeat, I am NOT a gunsmith), the mainspring has been replaced!! And the trigger pull went from fourteen pounds to a whopping EIGHT! FTC – I bought all the screwdriver sets (except my roommate’s), the spring replacement kit and the revolver. Go and buy your own! A recent guest post was entitled as above. I’m posting it below, in it’s entirety, not just to entertain and inform, but to show those who do carry behaviors and appearances which may bring to them unwarranted attention. The following is an excerpt from 100 Deadly Skills: Survival Edition — The SEAL Operative’s Guide to Surviving in the Wild and Being Prepared for Any Disaster. A follow-up to Clint’s first bestseller — 100 Deadly Skills: The SEAL Operative’s Guide to Eluding Pursuers, Evading Capture, and Surviving Any Dangerous Situation — this new survival edition offers primers on any survival situation imaginable, from wilderness scenarios, to terrorism and kidnappings, to natural disasters. Individuals who carry a handgun professionally are well attuned to the range of mannerisms that can indicate the presence of a concealed weapon within their vicinity. Civilians, too, can learn to familiarize themselves with these signs and signals. When combined with suspicious behavior, the suspected presence of a concealed weapon should put bystanders on high alert. 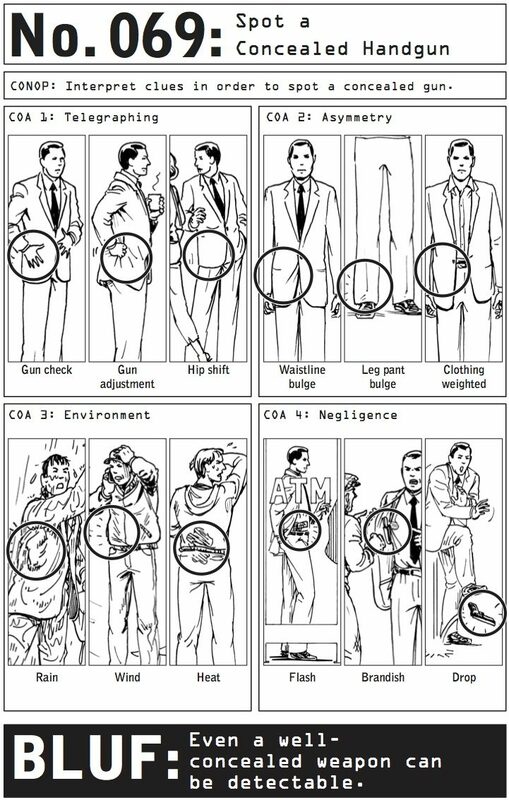 Body Language: People carrying handguns tend to subconsciously telegraph the location of the weapon via their body language. 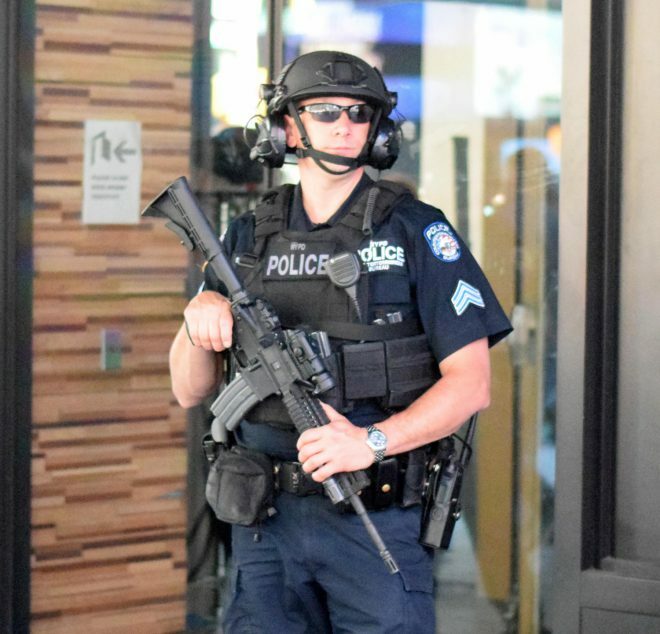 They may reflexively palpate the gun to make sure the weapon is still safely in its holster, subtly re-position the weapon prior to sitting or standing, or shift their weight away from nearby bystanders to avoid accidental contact with or theft of the weapon. Asymmetry: Another telltale sign is asymmetry in clothing. Guns are heavy and bulky, and thus will betray signs of their presence to anyone who’s paying attention. An outside-the-waistband holster may cause a visible midline bulge, while an ankle holster may cause a bulge or tightening of the fabric at the lower leg. A gun held in a jacket pocket will weight down one side of the jacket unevenly. Environment: Hot or inclement weather can make concealed weapons easier to spot. Rain, wind, or sweat can reveal the outline of a gun, which will generally be much easier to hide under multiple layers of cold-weather clothing. Negligence: Weapons are also frequently exposed due to temporary negligence, flashed or inadvertently dropped as a gunman reaches for his wallet. Dropped weapons are an all-too-common scenario at public urinals, where inexperienced perpetrators may thoughtlessly unzip their pants — thereby releasing the tension that was holding up the holster. The post How to Spot a Concealed Handgun appeared first on The Art of Manliness. Whenever I travel somewhere, I have a tendency to notice armed police/security. Especially when they are carrying rifles. Just one week after the Chelsea bombing in NYC, my wife and I took our 4 month old to visit NYC. It was a bit of a risk since I could not legally carry in NYC, but then CCW won’t do much against an IED like what was used last week.. Anyway I noticed an increase in police activity. A lot more police officers on patrol. When I took this picture, I saw people coming up to these officers and thanking them for their service. However these other officers stood out like sore thumbs in Time Square. They are all wearing Ops-Core helmets and what look like plate carriers. I do like that they have modernized and are using hearing protection which also doubles as communication head sets to their radios. The rifles are sporting what looks like Aimpoint Pros with rear MBUS. The front sight is a folding gasblock front sight and the railed handguards have Inforce WMLs. I remember posting about civilian police being deployed on a regular basis in teams with selective-fire weaponry some time ago. Beginning in NYC. And I was told this is already occurring in other metropolitan areas. I remember active discussions in my Police Science classes (in the mid-70’s) regarding civil liberties versus police presence. And the general consensus was we, as a society, preferred NOT to have cops on every corner! Having them in teams with rifles was not even on the radar, then! YES, we need policing. How we go about it is the question. And how we preserve, protect and defend The Constitution (including The Bill of Rights, of course) is another question. The fact that we even have to ask these questions in the wake of the BLM violence and the cop killings in California (on a domestic violence call) further makes the point. How armed do we want the police to be versus the legally-armed citizenry? I remember (way back in the 1970s – when I got into gun stuff as an adult) fantasizing that I lived in a State that had concealed weapon permits! How cool would THAT have been? Being able to be armed – discreetly! One of the reasons I wanted to become a cop was that very reason. It seemed sad that few States had permittage, and most of them were may issue. Usually meaning unless you were one of the special few (or perhaps funds changed hands) you either did nor carry concealed, or did not carry concealed legally! Now, here we are in the new century, and the tide has turned. A significant number of States how have concealed weapon laws and some even passed Constitutional Carry – no permit needed! Specifically, with the addition of Missouri, 11 States (22% of the 50!) no permit required! Of course, we still have States like California (and New York), with their difficult to get may issue permits, and checkerboard of convoluted and restrictive gun laws. BUT, things have definitely improved since the 1940’s, and in spite of warnings to the contrary regarding every CCW (carry concealed weapon) and Constitutional Carry law being passed, there has been no blood in the streets! It’s been said that the American Revolution was started and maintained by just 3% of the population. In spite of the ubiquitous onslaught of the anti rights control folks, we seem to be winning! Hooray for the responsible, law-abiding citizens, going about their private business invoking their right to possible self-defense! Pull your respective heads from the sand (or wherever) and listen up! (name excised), whom police nabbed and shot after a day-long dragnet in connection with a series of terror attacks in and around New York was a bad father who disliked America, hated gays and took long trips to his homeland of Afghanistan, the mother of his young daughter exclusively tells FoxNews.com. Whether or not the attackers have some twisted view of the religion of Allah, or Christ, the Easter Bunny, LGBTQ or LSMFT is of no consequence! Is it ‘workplace violence’? Who cares? I DON’T CARE ABOUT THE ATTACKER’S MOTIVATION! I’M ONLY CONCERNED ABOUT PRESERVING LIFE, FAMILY, FRIENDS AND THE REPUBLIC! THIS BEGINS WITH MY MINDSET! War is no longer defined by geographic boundaries. Nor are the participants. Nor does the enemy seem to have signed the Geneva Convention rules. EVERYONE is considered a combatant (or potential target) by the enemy. TERRORISTS (foreign and domestic) seem only interested in causing as much death and mayhem as possible. POLITICIANS are only interested in using these attacks to feather their own nest and denying the citizenry their natural rights. We must take the fight to them! First, go about our daily lives. If we hide cowering, they win! ALWAYS CARRY EVERYWHERE! REMAIN IN CONDITION YELLOW AS MUCH AS POSSIBLE. CHECK YOUR SIX. And if you pray, please do so. I AM a learner, albeit a slow one. After shooting a friend’s Smith & Wesson J-Frame Monday last ( 🙂 ), I’m considering improving the trigger pull on mine. I’ve been carrying my S&W model 442 – electroless nickel for going on 22 years. With the stock trigger (15 pounds?). Because that’s the way it came. And I shoot ‘okay’ with her. HOWEVER, my friend’s revolver had a trigger-job done on his. And the result was amazing. I inquired if he ever had a problem with lack-of-ignition. He replied in the negative. As stated before, I cannot afford an over-priced dilettante the services of a gunsmith. Off to the Brownell’s website! They have all manner of replacement spring kits for S&W J-Frames – including a Wilson version with one (7 1/2 pound?) mainspring and three choices of trigger return spring weight! And, while I’m not the most mechanically-adept (insert laughter here, Dave!) I do know how to remove the side plate and remove/replace springs. My questions are – is this a good deal? Beneficial to the gun’s function? Are there other choices out there of similar cost that are better? I figure minimally, I get to detail clean and lube the revolver and possibly improve function. Smith & Wesson and Brownell’s gave me nothing! Go Away FTC!